Excellent value for money bed and mattress set. Classic shaker style finished in a stone white lacquer that works with a wide range of bedroom decors. Looks stunning in modern and traditional bedrooms. Premier mattress is a traditional coil sprung mattress with a soft damask cover. The depth of the mattress is 18cms. Produced in the UK and complies with all relevant UK regulations. Ideal for children's or guest use. 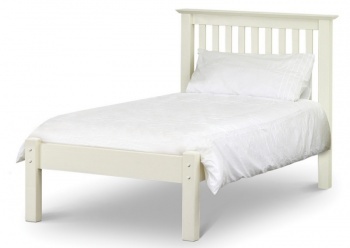 Construction: Bed frame made from solid pine and MDF in a stone white lacquered finish. Wooden slatted base. No need to struggle this bed and mattress set is delivered by a two man delivery service to a room of your choice. If the delivery team believe that damage to the product or premises, or injury to themselves or others, may occur whilst delivering to your chosen room they will leave the goods in a safe and convenient place.